The minister for disabled people has refused to approve two key recommendations made by the independent reviewer of its new disability benefit, which would have made it easier for claimants to protect themselves against dishonest assessment reports. Among the recommendations made for improvements to personal independence payment (PIP), Paul Gray said earlier this year that all assessments should be recorded, although claimants should be able to opt out if they wanted to. He also said that all PIP claimants should be given a copy of their assessment report when receiving the letter from DWP telling them if their claim has been successful. But despite telling parliament that she had accepted all Gray’s recommendations, Sarah Newton, the minister for disabled people, has failed to accept either of these suggestions. In DWP’s response to Gray’s second review of PIP, Newton’s department claims it has “partially” accepted the two recommendations. On automatic audio recording of assessments, having already completed one pilot of audio recording of 400 assessments, DWP now says it is “looking at a further feasibility study”. Providing copies of assessment reports to all claimants and audio-recording assessments would both be likely to make it harder for assessors working for the discredited outsourcing companies Atos and Capita to produce dishonest accounts of assessments. Over the last year, Disability News Service (DNS) has collected nearly 300 cases in which PIP claimants say that the assessment reports prepared by their assessors were dishonest. DNS has also revealed that complaints about the PIP assessment process rose by nearly 900 per cent last year, while the number of complaints upheld rose by more than 700 per cent. Labour MP Frank Field, who chairs the Commons work and pensions select committee, which is investigating the assessment processes for PIP and employment and support allowance (ESA), said the government’s response to Gray’s review – including the recommendations on providing copies of reports and recording assessments – “offered a series of promises to do almost nothing for claimants” and contained “a remarkable variety of different phrases for not taking action now”. He gave the example of a disabled woman with cancer from his Birkenhead constituency, who was doubly incontinent but had been refused PIP, and was having to clean and reuse her babies’ nappies because she had no money. He said: “We have heard literally thousands of accounts of the stress and suffering caused by the assessment process for PIP and ESA. He added: “Paul Gray made really clear, helpful, evidence-based recommendations, several [of]which have been clearly articulated in evidence heard by the committee. Among the examples he gave, he said DWP had responded to Gray’s recommendation that evidence provided by carers and companions should be given sufficient weight by saying it would “investigate how assessments could be better structured” to allow this. And on allowing assessors more time to consider additional evidence provided by claimants, DWP said it would “develop a process to gather information… on the timescales needed to prepare for assessments”, said Field. 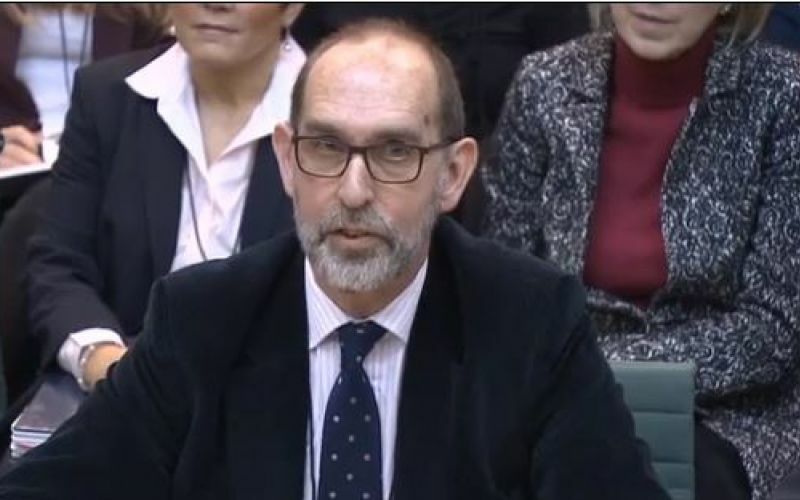 Yesterday, Gray – a former DWP permanent secretary – gave evidence to Field’s committee (pictured), and told him that he was “probably a little disappointed” with the government’s response to his review. He said he was “struck to some degree” by Field’s concerns about the government’s response because, even with recommendations that were fully accepted, “there is use of words like ‘explore’, ‘consult’, ‘look into’”. He said the current system, which means PIP claimants must bring their own specialised recording equipment if they want their assessment recorded, was “incredibly clunky”. He said it would “significantly improve people’s trust in the system if audio recordings were available” and “would have very beneficial behavioural impacts if assessors know they are being recorded”. He also said that giving people a copy of their assessment report automatically was “important to improve trust”, and that he was “not persuaded by the government’s response”. Newton told the committee later that she agreed that the availability of audio recording of assessments was “not good enough”. She said she approached this issue with “a very positive attitude towards wanting to record the assessments because I think it will be of huge benefit to the person doing the assessment and to the person who is being assessed”. But she confirmed that there would have to be further tests first, and if there was a change it would need alterations in the contracts of the assessment companies. Meanwhile, results from the latest stage of research into the PIP process, carried out on behalf of DWP by Ipsos MORI and based on more than 1,200 telephone interviews, has found that more than one in four (26 per cent) of those questioned said that the “measurements and functional tests” used in the assessment were not “relevant and appropriate”. One in four (24 per cent) said the questions asked by the assessor were not “relevant and appropriate to my condition”. And more than one in five (22 per cent) said they did not believe the assessor had listened to them during the assessment. The same proportion (22 per cent) said they did not believe the assessor had understood their application form and supporting evidence. Only 65 per cent said the venue was easy to get to, and only 83 per cent said the assessment venue was accessible. But nearly nine-tenths of those questioned (89 per cent) said the assessor had treated them with respect and dignity.